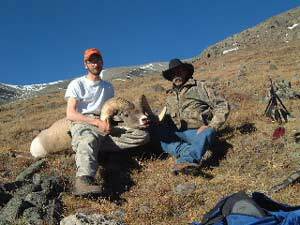 At the age of 18, I was lucky enough to draw a bighorn sheep tag for a terrific hunting area. We decided not to hire a guide, and just try our luck on our own. I was joined by my father (Steve), mother (Phyllis), brother (Toad), and my cousin (JR) on some of our pre-scouting trips. The season open on the first of September. The day before opening morning we packed hunting camp into the backcountry (10,000 feet in elevation) my cousin wasn’t on this trip. On our way in, we spotted a package of 13 rams with a couple of shooters in them. They were a long ways away, up in a grassy, rocky basin. After not sleeping all night, we awoke to a clear morning. My dad and I would put a stock on them, while my brother and mom would keep an eye on them from the bottom. We parked our horses in the timber at the base of the basin, out of sight. From there, we began our climb up the basin, trying to stay undercover. We were able to sneak out into the middle of a rockslide where we got a closer look at the rams. We decided that the only way to get to them was from the top. After a long and grueling stock, we were final near them. The rams must of scented us because they got really nervous and took off. I was able to get three shots off, but to no avail. We returned to camp that night, where we met up with my mom and brother. We were headed back home the next day. I had to back to school and work was calling the rest of them. As we were packing up camp the next morning, shots rang out from the cliffs above us. A guide outfitter got one of the rams directly above our camp. On September 19, we headed back up in hopes of finding another dandy ram. On this trip, my brother stayed home, but my cousin came instead. 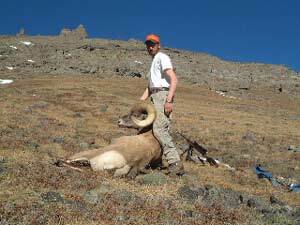 We were never able to find the same group of rams that we did on the opening weekend. After the second day without seeing any rams, we split up to try and find some. My cousin and I went one direction, while my dad and mom went the opposite direction. After a mile or two after we split up, we began spotting bighorn sheep. By the time the last rays of sun snuck behind the mountain tops, we had seen roughly 25 head of rams. With a couple of them being real dandies. When we met mom and dad back at camp, they told us that they hadn’t even seen a ram. The next morning, my cousin had to head home, so we were down to mom, dad, and me. We rode out of camp at 1o:00 in the morning. We reached the basin that the rams were in the previous night by about noon or a little after. We set up our spotting scopes in the exact place we had the night before. We glassed for what seemed like hours and never saw anything worth going after. All we saw was a couple of little rams. Finally we spotted a nice ram in the head of one the basins. He was a long ways away, so I was going to take my rifle and pack and try to put a stock on him, while mom and dad watched from the vantage point. About a quarter of the way to the ram, I spotted 5 just DANDY rams in the head of the opposing basin. I waved for mom and dad to come up. Once they got up to me, I put a 2 hour and 45 minute stock on the ram, with the last hour crawling on my hands and knees. 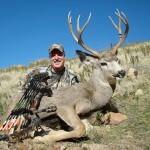 Once I topped over a little hump that divided the rams, and me I had a straight shot at about 500 yards. While I was out of sight, a couple more rams joined up with them. After watching the rams through my spotting scope, I finally made my choice. 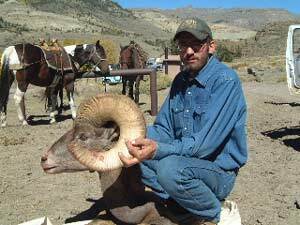 As I had him in the cross hairs and about to pull the trigger, I just happened to look to the right and saw even a bigger ram. He was bedded down. I waited for him to stand up and turn broad side. When he did, I released on him. The first shot was a miss. The rams all jumped up and headed in my direction. At about 450 yards, they turned with the good ram in the lead. I pull the trigger, another miss. Just as they were about to cross the ravine, I shot again. I couldn’t believe it, a HIT. When they came out the other side, he had separated himself from the rest. I shot again and that was “all she wrote.” At 4:20 in the afternoon, my tag was filled. Now the hard work began. With this area having a little bear problem, we didn’t have much time. After a bit, my parents reached me. We began the boning and capping process. We made it back to horses, which were at the base of the basin right at dark. With blood up to our elbows and a sheep on our packhorse, we began wondering about the ride out of there through the dark timber. After a 2 and a half hour ride back to camp, we hung the sheep in a tree, put up the horses and ate dinner. My heart was still pounding. There is just no way to explain that feeling to anyone who hasn’t experienced it. The next day found us packing camp and headed home.